Bass fishing in the Okanagan for the most part is very much overlooked and landing Largemouth and Smallies to 7 pounds is achievable. Our Bass fishing charters are done on Osoyoos and Skaha lakes and we can accommodate 2 anglers in our 14′ Crestliner boat. Our Bass season begins in late April and runs through to mid October. Our boat is equipped with a whisper quiet 40 hp Suzuki four stroke and a Minn Kota 55 pound thrust bow mounted electric motor. Full day charters are the norm due to the travel time to these lakes. 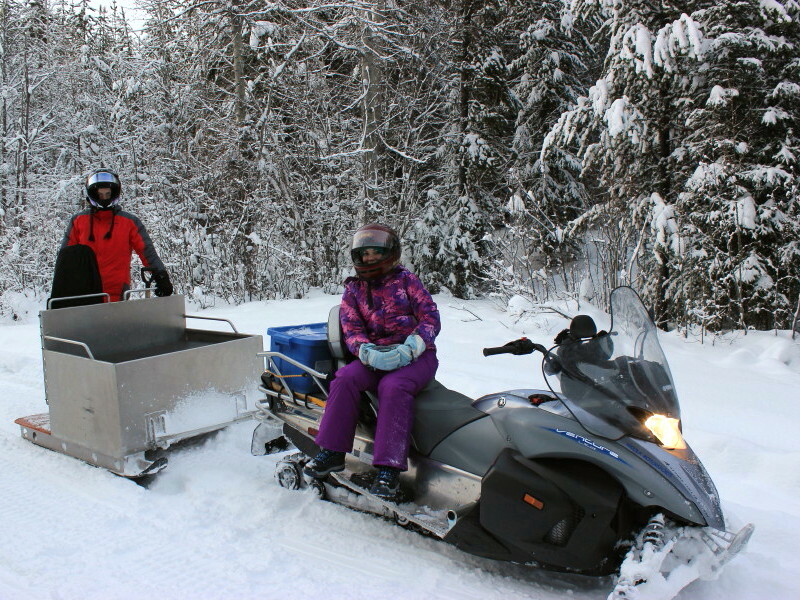 We depart from West Kelowna where guests may ride in our vehicle or if you choose, you can meet your guide at the lake. We supply all safety, fishing equipment and bait needed. 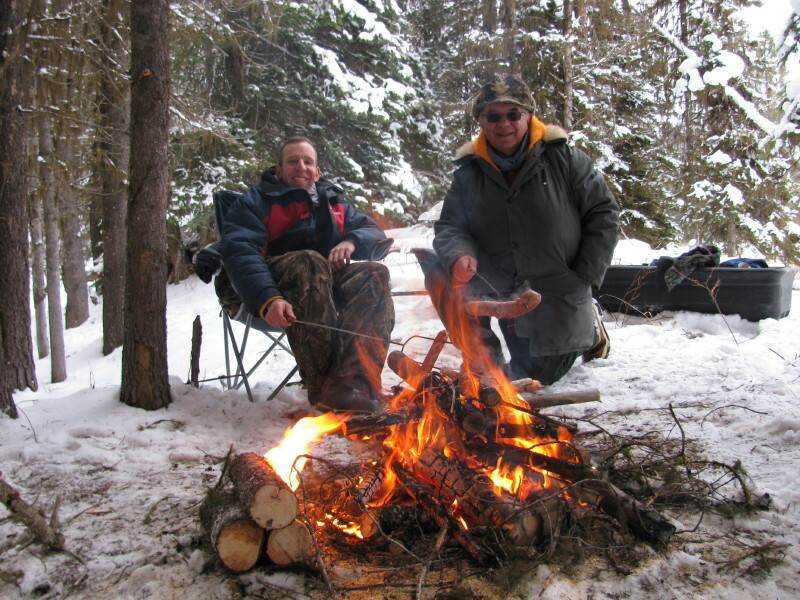 You are responsible for your fishing license, food and drink for the day. Upon request, we can supply a box lunch for you that consists of a breakfast muffin, custom built sandwich, chips, fresh in season fruit or vegetables and dip, dessert and your choice of water, juice or pop. Cost for your box lunch is $25.00 per person. 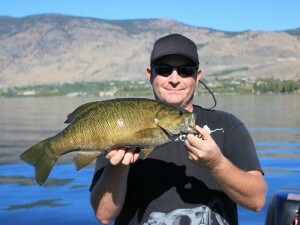 Skaha Lake is home to many species of fish but when it comes to Bass it only has Smallmouth. In a typical days’ fishing the average size is in the 12″ range with a few 3 to 4 pounders. Our largest to date is 5.8 pounds. This is a numbers lake…lots of fish! Skaha lake is host to some nice areas from fishing tight to cliff faces, Islands and large flats that have steep drop offs and weed beds that usually hold some good numbers of fish. 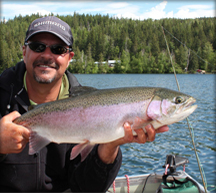 We fish Skaha lake June through September. 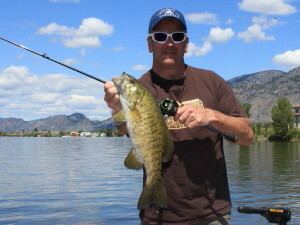 Osoyoos Lake holds both Large and Small Mouth Bass. Although both species reside in the lake we typically target the Smallies. Like Skaha this lake holds good numbers of Bass but the average size is in the 2 pound range with a few 4 to 5 pounders caught most days. Our largest to date is 7.4 pounds. 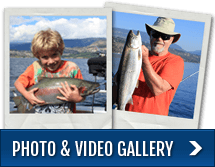 We fish Osoyoos in May and again in September. If you are looking at staying overnight in Osoyoos while fishing with us look no further than the Watermark Beach Resort. It’s the perfect place to stay while in Osoyoos and hey…it’s a 5 minute walk to the boat launch where we’ll meet for your day of fishing! In both lakes quite often throughout the day of fishing we usually have a by-catch of Rainbow Trout, Pike Minnow, Perch and Carp. Most Carp are the Common Carp variety but we did hook into a Mirror Carp once of about 6 pounds that really took us for a run! When fishing with conventional equipment our rods and reels are simply the best, Shimano. We use an assortment of casting and spinning rods loaded with PowerPro and Flurocarbon lines. Our spinning rods are Shimano’s finest, Compre, Crucial and Cumara mated with Stradic CI4 1000 spinning reels and when casting we use the Crucial and Cumara rods mated with Curado 200’s. Some techniques we use are pitching and dragging tubes, wacky rigging senkos and drop shotting Jackall minnow imitations and of course we Texas Rig! Yes, we also fly fish for Bass! Fly fishing for Bass will put most fly fishers to the test. A simple rod lift will not usually set the hook and strip sets are essential for hooking up with these powerful fish. We use G.Loomis fast action rods in 5wt. mated with Ross Reels and S.A fly lines. Fly’s are hand tied by Rodney.